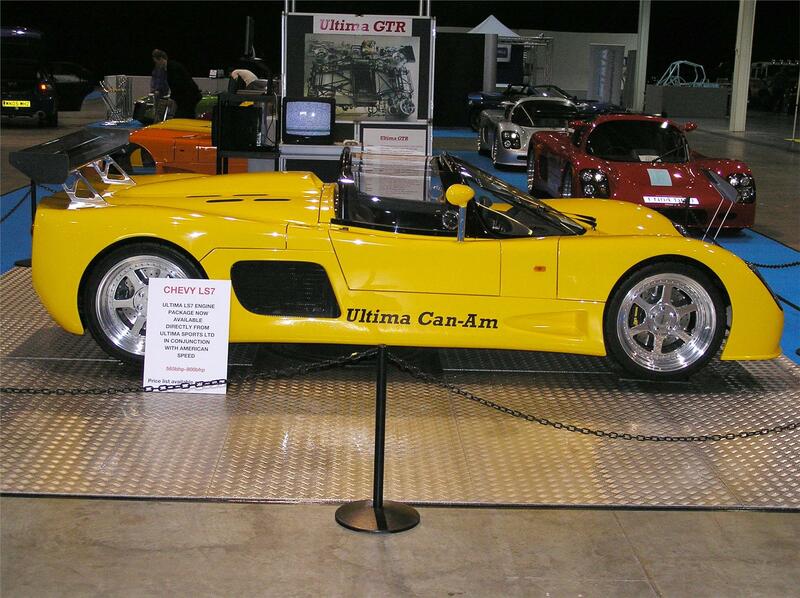 The Ultima Can-Am has been superseded by the Ultima Evolution Convertible and is no longer produced. Spare parts are available for this model. Launched in 2001, the Ultima Can-Am is a sensational convertible road car that boasts exactly the same league of world beating performance as the Ultima GTR, but in an exhilarating wind in the hair experience. At the heart of every Ultima Can-Am convertible is the company's race-proven spaceframe chassis which, allied to purpose-built independent suspension and bespoke parts throughout, offers a level of handling and road-holding way beyond any conventional car. Power is provided by a mid-mounted Chevrolet V8 engine mated to a Porsche transaxle. In standard 300bhp tune it's enough to propel the Can-Am from 0-60mph in under four seconds before posting a top speed which is best described as more than adequate! The Can-Am was available with a full range of road car options including a fully waterproof soft top roof which was designed to remain watertight even at speeds exceeding 200mph, air conditioning, leather trim and sealed luggage compartments for continental touring. The Can-Am was also available with interchangeable front screen options. The production car feel of the Ultima is immediately apparent, from the specially moulded headlight housings and covers to the immaculate panel fit and lack of any external body catches. Chassis: Full spaceframe using mainly 38mm x 1.5mm tube MIG welded. Powder coated and panelled in 1.5mm NS4 Alloy sheet. Designed to accept engines up to 2000bhp. Wing: Double element track design in carbon fibre. Body: Unpainted GRP finished in immaculate gel coat finish. Interior: Ultima leather/alcontara seats and dashboard. Lighting: Ultima triple headlight system. Screen: Full laminated glass windscreen. Suspension: TIG welded double unequal length heavy duty wishbones with rod ends and spherical joints. Alloy uprights cast in LM25 and heat treated to TF. Fully adjustable coil spring damper units. Steering: Ultima alloy sports rack and pinion 2.4 turns lock to lock. Brakes: 12.7" curved vane vented disc brakes all round with four pot calipers and mechanical handbrake. Adjustable brake bias front to rear. All s/s hoses. Engine: Chevrolet V8 engine from 300bhp to over 1000bhp. Gearbox: Porsche 5 or 6 speed transaxle. Wheels: 9" x 18" front, 13.5"x 18" rear alloy three piece with 5 stud centres machined from billet alloy. Tyres: 245/35ZR18 front 335/30/ZR18 rear.